Larry Chiang writes about entrepreneurship and pre-entrepreneurship. He edits the Bloomberg BusinessWeek channel “What They Don’t Teach You at Business School”. Whilst tempting to linger on those topics, the job market demands that this article moves on to another of Larry’s points of focus – Mentorship. People focus on finding a job, but if you find a great mentor, finding a job is the easiest thing you can do, and it’s absolutely essential to entrepreneurship. You can also have more than just one mentor. Why restrict yourself to one mentor? Most of the great success stories have great mentors (think Jamie Dimon + Sandy Weill!). I suggest you watch the movie Monsters, Inc. That’s mentorship 401 where Sulley gets mentored by Waternoose, Mike, Boo and even Randall (What?! You don’t watch cartoons at HBS? Pixar is strategy!). Face it, most business is cut and paste, how good your template starts off defines how good you will be. It is so about standing on the shoulders of giants. Great – so how do you go about finding a mentor? Woo your would-be mentor by reading about them (googling someone is just polite, not stalker behavior). Be value-added. It’s a 2-way relationship and you can give as much as you receive. If you hear of a great new book, or article, email them about it. Stalk them into being a temporary book club pen pal. Study buddies turn into work buddies and work buddies will mentor you. Follow up after your first meeting. Most people don’t. Snail mail is also very unique these days! Bribe them with personal touches (everyone likes chocolate). My bribes come in the form of handwritten cards-simple, I know, but that’s what works-notes interwoven in office junk mail to brighten up the post box leave an impression. Make it simple for them to “feel” what you do and why. It’s easier if what you do is helping other people. Then they can be a consumer advocate, too. But regardless they need to be able to explain you in two sound bytes to someone else. Leverage mentor dynamics. People that are like each other tend to like each other. Maybe their kids don’t listen. But you will. Find one that is similar to you. Thank your mentor publicly. When you see them at networking events, point and say: “Hey look there’s my mentor!” They may deny it feels good but deep down mentors love to be recognized. So is an HBS/GSB MBA a waste of time? Not at all, I think it’s hugely valuable. However, the faster you can adopt the community college hustle, the faster you’ll succeed. In the first 4 years out there, major setbacks will test your mettle. How you deal with it will define much of what you go on to do. This is where a mentor is most valuable. They see things that you don’t. Here is a great phrase from my mentor: “The ability to learn from someone dumber than you is the key trait to personal growth.” Another great point is, “Generally speaking when your lips are moving you aren’t learning anything.” The most critical reason to have a mentor is to leverage O.P.E. (other people’s experiences). So who’s been your mentor? Well, remember I love cutting and pasting. 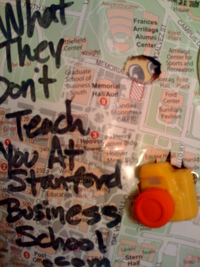 I cut and paste a business model for Duck9 from Princeton Review. I even cut and pasted my way to a book deal. It’s a sequel to a book I did not write. 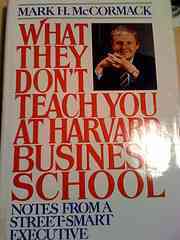 Mark McCormack, the founder of IMG, was the author of What they don’t teach you at Harvard Business School. It’s a great book and it was a bestseller in the 80s. You should buy it. And that is thanking my mentor publicly! Paul Thomson is from Scotland. He writes articles to avoid doing work on field studies, term papers and anything else that can be procrastinated upon. View more presentations from Larry Chiang. School”. Chiang is a keynote speaker and bestselling author and spoke at Congress and World Bank. You can read more equally funny, but non-founder-focused-lessons on Larry’s Amazon blog .